From formal meetings to informal cocktails and dining, The Grands at Mulligans is an unforgettable venue for any type of social or business event. Different than the traditional hotel environment, The Grands offers a warm and friendly atmosphere for company parties, management brainstorming sessions, casual meetings, and other types of business events. With two large patios, a water fountain, and private setting overlooking the Pine Ridge Golf Course, it’s the perfect setting to entertain your customers, employees, and vendors. The incredible ambiance, complete privacy, and beautiful surroundings at The Grands at Mulligans make it a “one-of-a-kind” facility. Why The Grands? The Grands at Mulligans has the best food and service in town! We have an Executive Chef that everyone raves about. See our testimonials. The Grands at Mulligans is a completely private facility. The Grands offers great picture opportunities inside and out. We have two rock fireplaces, 20-40 foot ceilings, two spacious rooms with large windows, attached completely private patios overlooking the Pine Ridge golf course. There is plenty of attached parking at no additional cost to you. Valet parking is available. The Grands has a Shuttle Service option to the local Sartell and Hwy 15 hotels. For $200 - $300 we can take care of all of your transportation needs. We have an in-house state of the art DJ Service (The Grands Entertainment) that will blow you away! We put over $100,000 in this new system. From your initial contact with our friendly and knowledgeable staff through the day of your event, you can be assured we won’t miss a detail as we guide you through the planning process. You’ll work with some of the most professional and talented people in the industry. The Grands at Mulligans prides itself on our exquisite entrees. Whether it’s a classic entree or a five-course gourmet dinner, we have a variety of delicious food options to please your guests. Our prime cuts of seasoned beef, specialty dishes like Parmesan Encrusted Chicken, specialty sauces and seasonings, and close attention to detail are what set us apart from the rest. 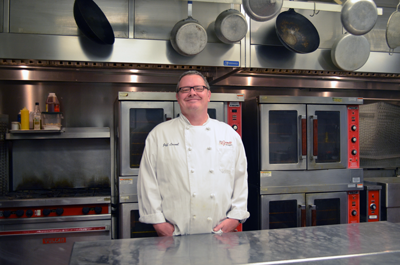 With over 30 years of experience working in country clubs, major hotels, and restaurants in Colorado and Minnesota, Chef Laumb is happy to be back in Central Minnesota where his career started. Three decades in the food industry has gained him experience in upscale and fine dining kitchens to unique casual dining restaurants, banquet facilities, and off-premise catering. While classic dishes are the foundation of Chef Laumb’s culinary skills, his unique style is on the cutting edge with flavorful ingredients and superior food presentation.